While attending the BPM Europe Conference 2012, I started by following the seminar by Sandy Kemsley on Social Business Process Management. This is extremely interesting, as it unfolds the concepts that I was investigating in some of my past posts on social BPM options and adoption levels. But here the orthogonalization makes the problem much more crisp and clear. This is also close to the continuum of social BPM, but again focusing on one specific orthogonalized aspect at a time. Social as a feature or as an application? The point with Enterprise 2.0 is that several social tools exist now, and the challenge is how to put them together in a productive and coherent way, without irking to build yet another stack of silos, in the socialization domain. There is a huge social enterprise software confusion, and social BPM is part of it. Socialization, as well as any other enterprise issue, should be tackled as a comprehensive problem at enterprise level. The main challenge is not to reduce this to simply selecting a set of social tools to be used. Social must become an attitude and a lifestyle in the enterprise. You can get Social process discovery and modeling, and this is covered by several vendors. However, it’s much more interesting to have social process execution. This is covered by vendors such as HandySoft and Fujitsu. Major vendors like IBM are also expanding their features towards Adaptive Case Management (ACM), by covering as much as possible of this within their BPM products. This is very similar to the Facebook timeline or other customer-oriented event streams. This is also a major user interface change in the enterprise. Events may have a direct link to underlying process models or instance. One can subscribe to a stream by topic or by author or other. Enterprise systems get usable, mobile and quickly accessible. Producers of these class of products include: Appian Tempo, Tibco Tibbr, IBM Blueworks Live. Several other ways exist for making BPM social, such as online communities (internal centers of excellence, external communities of practice, marketplaces): this is covered by IBM BlueWorks, Appian, and Software AG Aris. In small, this is also what the WebRatio Store is aiming at in the near future (while now it’s mainly focused on WebML features). Some producers are offering BPM Software as a service solutions, with cloud deployment(Appian Anywhere, Fujitsu InterstageBPM, Cordys Process Factory and other emerging ones). WebRatio is also moving towards the cloud, but at the moment the development part is based on the Eclipse-based standalone tool suite. While the technology is not cutting edge any more, organizational impacts and benefits are still challenging for the enterprise. 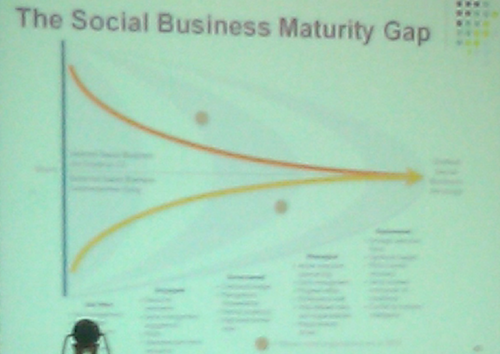 Social Business has now an ad-hoc social business maturity model. The social BPM maturity gap. Internal: above, orange line. External: below, yellow line. The current status of most companies is currently in the state “engaged-structured” internally and “structured-managed”externally. The main challenges are on culture and collaborativeness. Enterprises need to trigger a participatory culture, considering people’s contribution independently of their role, increasing transparency and openness, allowing and empowering employees to deviate from predefined processes. A nice bottom line for the discussion is that Social BPM means to monitor events and not outcomes of BPM. The last point you said certainly hits a chord, specially how it seems things these days can't get done without people coming together. You can't make a car dealership seo campaign work if you don't have customer feedback coming in, for example. I completely agree with you. Collaboration is a must and Social BPM should be a tool for favoring it. It's important that collaboration is an effect of adopting Social BPM, not a pre-requisite. Otherwise any attempt at it will fail.